Arsenal to make deadline-day swoop for Domagoj Vida? Arsenal are reportedly planning to make a deadline-day swoop for Besiktas defender Domagoj Vida. Wolverhampton Wanderers to win race for Besiktas defender Domagoj Vida? Wolverhampton Wanderers are reportedly in pole position to sign Besiktas defender Domagoj Vida before the end of the transfer window. Arsenal to move for Croatia international Domagoj Vida? Arsenal boss Unai Emery will reportedly launch a bid for Besiktas defender Domagoj Vida if he can make a high-profile sale before the end of the transfer window. Liverpool are continuing to work on a deal to sign Domagoj Vida from Besiktas after agreeing personal terms with the player, according to a report. Arsenal reportedly enter the race to sign Besiktas and Croatia defender Domagoj Vida, who is also wanted by Liverpool, Everton and West Ham United. A report claims that West Ham United are to rival Liverpool for the signing of Besiktas centre-back Domagoj Vida. A report claims that Liverpool have returned with a £20m bid for defender Domagoj Vida, which is still thought to be below Besiktas's valuation. France win their second World Cup title courtesy of a thrilling 4-2 win over Croatia in the final at the Luzhniki Stadium in Moscow. Domagoj Vida will be available for selection when Croatia take on France in the World Cup final after dodging a FIFA ban. Liverpool will reportedly make an improved second bid for Besiktas and Croatia centre-back Domagoj Vida, having seen their first approach rejected. Sports Mole provides team news, predicted lineups and a full match preview ahead of England's World Cup semi-final against Croatia in Moscow. Liverpool reportedly see their opening bid of almost £16m for Croatia international Domagoj Vida rejected by Turkish club Besiktas. Sime Vrsaljko ruled out of Croatia's World Cup semi-final with England? Croatia full-back Sime Vrsaljko is reportedly ruled out of his side's World Cup semi-final with England due to a knee injury. Croatia boss Zlatko Dalic insists that his team can stop England captain Harry Kane in Wednesday night's 2018 World Cup semi-final. Croatia centre-back Domagoj Vida escapes a two-match ban for dedicating his side's penalty-shootout victory over Russia to Ukraine. Liverpool reportedly submit a bid of £12m for Croatia defender Domagoj Vida. Everton reportedly identify Ben Gibson and Alfie Mawson as possible summer recruits. Liverpool bid for Croatia international Domagoj Vida? Liverpool are reportedly keen on signing Besiktas defender Domagoj Vida, who is currently representing Croatia at the World Cup. Croatia defender Domagoj Vida insists that his team have the credentials to win the 2018 World Cup. Mario Mandzukic leads the Croatia line in Sunday's 2018 World Cup last-16 clash with Denmark. Everton offer Davy Klaassen in exchange for Domagoj Vida? Everton reportedly plan to use Davy Klaassen as a makeweight in a deal that will bring Besiktas defender Domagoj Vida to Goodison Park. Watford looking to sign Besiktas defender Domagoj Vida? 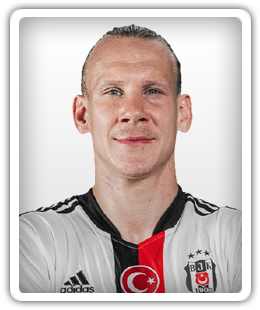 Watford are reportedly considering an approach for Besiktas defender Domagoj Vida, who could cost in the region of £3m. James Rodriguez is included on the bench for Bayern Munich's Champions League last-16 second leg against Besiktas. Thomas Muller and Robert Lewandowski score a couple of goals apiece as Bayern Munich thrash Besiktas 5-0 in the first leg of their Champions League last-16 tie. Relive Sports Mole's live text coverage of Bayern Munich's 5-0 thrashing of Besiktas, as the German side ruthlessly took their 10-man opponents apart. Everton, AC Milan target Dynamo Kiev defender Domagoj Vida? Everton and AC Milan are both reportedly keen on signing Dynamo Kiev defender Domagoj Vida during the January transfer window. A report claims that West Ham United, Stoke City, Everton and Sunderland all want to sign Dynamo Kiev defender Domagoj Vida. A report claims that Sunderland will bid £6m for Dynamo Kiev defender Domagoj Vida in the January transfer window. Ricardo Quaresma scores in the 117th minute as Portugal book their spot in the quarter-finals of Euro 2016 with a 1-0 win over Croatia in Lens. Mario Mandzukic and Luka Modric are named in Croatia's starting lineup to face Portugal at the Stade Bollaert-Delelis in Lens. Czech Republic come from two goals down to draw 2-2 with Croatia in their Group D match at Euro 2016. Tottenham Hotspur will reportedly look to bolster their defensive options in January by signing Dynamo Kiev's Domagoj Vida.